Losing more than they win on the road makes grim reading for Arsenal, as another tough trip to Vicarage Road awaits. The business end of the season is well and truly here, and with it comes crunch time. Both of these sides will need to take maximum points from this encounter in order to bolster their respective pursuits of European qualification. Watford return to Premier League action eight days after their exhilarating 3-2 victory over Wolverhampton Wanderers in the FA Cup semi-final at Wembley Stadium. The Hornets found themselves with a two-goal deficit to recover and just over 10 minutes remaining on the clock, but an outrageous goal from Gerard Deulofeu preceded Troy Deeney's stoppage time penalty as the Hertfordshire outfit miraculously lived to fight again. Deulofeu won the game for his side with a cool finish in the first-half of extra time. Their place in the Cup final means that a 7th-placed league finish will guarantee competition in the Europa League for next season, and with fellow contenders Leicester City, Wolves and Everton all dropping points at the weekend, Watford will be intent on making that spot theirs with a crucial victory here. Meanwhile, visitors Arsenal travel to Vicarage Road in the midst of a European double-header against Napoli. They lead their Italian opposition 2-0 from the first leg thanks to goals from Aaron Ramsey and Lucas Torreira, but must redirect their attentions to domestic affairs here as they continue their push for Champions League football next season. Something which has been a hindrance to that ambition is the Gunners' fairly variable form on the road. The last league outing — a 1-0 loss to Everton at Goodison Park — highlighted that, while Arsenal have emerged victorious from just three of their eight away games in all competitions since the dawn of 2019. That's in stark contrast to their remarkable 10-game league winning streak at the Emirates Stadium. Back in October, Craig Cathcart's own goal and Mesut Özil's quick-fire finish gave Arsenal a 2-0 win in North London, in a game in which the balance of play was tipped on a knife edge but quality and clinical nature proved vital in determining the result. The Hornets will more fondly remember the corresponding fixture from last season, when they overturned Per Mertesacker's opener with a Deeney penalty and a late winner from Tom Cleverley. The result left the home side fourth in the table with eight games played. 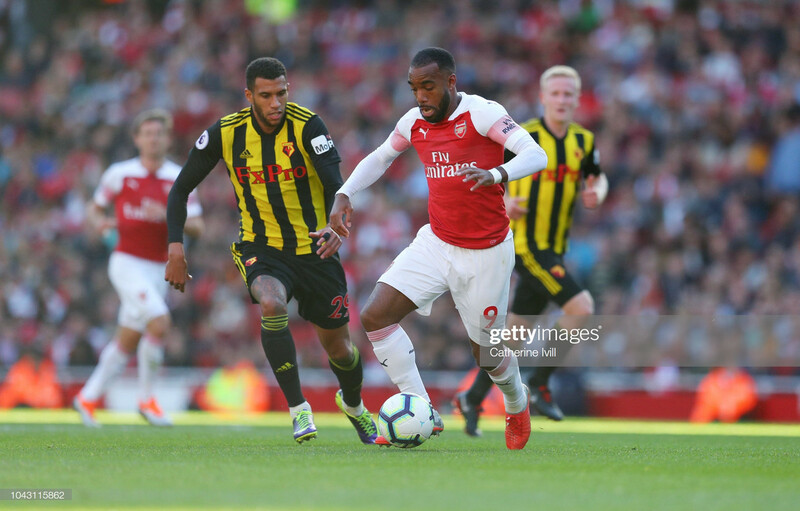 Historically, these teams are surprisingly well-matched — Arsenal have triumphed in 16 of the all-time meetings while Watford have won 12, and there has been just one draw between the sides, yet none in the Premier League era. Despite enjoying good form overall, Watford's record against the top six has applied the breaks on their pursuit of European football. The Hornets have won just one of their ten encounters with teams in that bracket, and head coach Javi Gracia recognises the difficulty of facing such opposition but insists his side are capable of gaining results nonetheless. "It's not only for us, but for most teams it's difficult to get points against these six teams," Gracia conceded. "I think we have two chances yet against Arsenal and Chelsea, and we will try to do it." The Spaniard maintains that his side have often played well enough to warrant more points against the big six, and believes that it's a case of endeavour which will eventually reap the fortunes. "I don't know why because in some of these games we were really close to getting points, but I think if we keep this level and this attitude in the next games, or in the future, we will be able to get better results." Meanwhile, Unai Emery is aware that he and his side are in for a challenging evening in Hertfordshire: "I know Javi and above all his teams are very organised with a big commitment to help each other. They are going to demand a lot from us but it is a good match and I appreciate it a lot. I think they are doing a big season." Emery was questioned in his pre-match press conference on whether or not poor away form was due to his side's psychology, but the 47-year old is adamant that their attitude is of a sufficient standard and believes he and his players have stumbled upon an ascendency. "We are fourth at the moment and playing to be in the top four," he responded. "This team has a good mentality and they are improving, we are improving and the table is giving us this answer — we are improving. "We are playing some matches and being competitive but in other the moments the opposition are more competitive than us and they battle us. Each match is a new challenge and response for us — starting Monday." Watford will have to make do without first-choice left-back José Holebas, who limped off from the semi-final last weekend. Midfielders Domingos Quina and Cleverley are both sidelined with shoulder and calf problems respectively. For the visitors, Sokratis Papastathopoulos serves the first of a two-match ban having accumulated 10 yellow cards, while Granit Xhaka will be assessed on a groin injury. Danny Welbeck, Rob Holding and Hector Bellerín remain long-term absentees. Watford — Foster; Femenía, Cathcart, Mariappa, Masina; Doucouré, Capoue; Hughes, Pereyra; Deulofeu, Deeney. Arsenal — Leno; Mustafi, Koscielny, Monreal; Maitland-Niles, Guendouzi, Torreira, Kolasinac; Mkhitaryan, Lacazette, Iwobi.